10/9/08 — Acquisition — Versailles, Musée national du château —Last 11 December, Jean-Jacques Aillagon announced the acquisition : « of an important piece of furniture belonging to the first Dauphin, listed as a Trésor National », without disclosing any more details. We came to the logical conclusion (see article) that this was the signed console by Charles Saunier, commissioned in 1787 for the Dauphin (ill.). A recent statement from the Ministry of Culture has confirmed the information. The piece was commissioned in 1787 for the new apartment of Louis XVI’s and Marie-Antoinette’s son, who was six at the time. 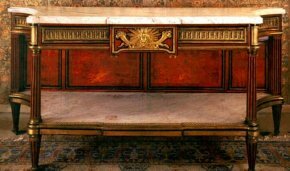 After having been sold during the Revolution, the console had been acquired by Casimir Pierre then in 1912 entered the collections at Vaux-le-Vicomte. It will now return to Versailles thanks to the patronage of the auditing, accounting and consulting firm KPMG who will benefit from a tax deduction.